(Reuters) - U.S. Special Counsel Robert Mueller is focused on a meeting at the height of the 2016 presidential campaign between Donald Trump's then campaign chairman Paul Manafort and a business associate prosecutors say has ties to Russian intelligence, according to a court filing on Thursday. 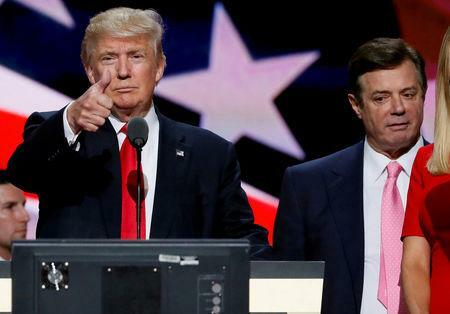 The Aug. 2, 2016 meeting between Manafort and Konstantin Kilimnik was one of several at which the two discussed a topic related to Ukraine, according to the transcript of a sealed Feb. 4 court hearing in Manafort's criminal case in Washington. Andrew Weissmann, one of the prosecutors on Mueller's team, told the judge that Manafort's alleged lies about his meetings with Kilimnik were significant because they related to "what we think is going on, and what we think the motive here is." "This goes, I think, very much to the heart of what the Special Counsel's Office is investigating," Weissmann said, according to the court transcript. Kilimnik, who was indicted last year on charges of witness tampering in Manafort's case, has denied having ties to Russian spy agencies. One of the discussions took place in person in January 2017 when Kilimnik was in Washington for Trump's inauguration, the filing said.